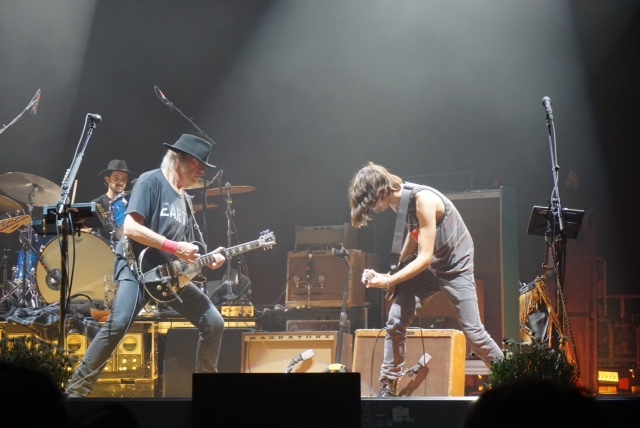 Neil Young + Promise of the Real will be performing tonight, June 16 at Le Dome in Marseille, France. Set-lists continue to amaze, and I won't read too much into "Only Love Can Break Your Heart" unless it appears a few more times. Europe is certainly being treated to some special shows. I'm not sure I want to ask this question, but I will. How have the attendance figures been at the shows? I sense they've varied somewhat, from so-so to very good. I would love to see a video of 'La Vie en Rose'. I can't wait until Rome. These setlists are absolutely absurd and amazing. We're all living in some lucky times, to be alive when Neil is still doing this with so much energy. Mother Earth is more than Neil Young's title heroine here; she is an instrument too. Recorded live last year with his current, youngblood combo, the 13 songs – all pulled from the ecology section of Young's library – are overdubbed with choral gleam, extra guitar drama and noisy approval by a peanut gallery of livestock, turkeys, insects and crows. There is also rolling thunder and hard rain, hinting at the payback to come. As Young sings in "Mother Earth (Natural Anthem)" from 1990's Ragged Glory, "How long can you give and not receive?" Earth stops at songs as far back as 1970's "After the Gold Rush" and "Vampire Blues" from 1974's On the Beach. But these performances are more urgent, in point and force, than Young's 2015 studio manifesto, The Monsanto Years. In the jubilantly rough, electric stretches of "Hippie Dream" and "Big Box," it's like you're getting 1991's live Weld cut at Farm Aid with the last-stand fervor of Freedom. The applauding ducks and geese after the half-hour freakout "Love and Only Love" are Young's reminder that nature itself is music – and silence is not an option. Just back Thrasher, awesome show. These guys just get better every time I see them. Loner was a nice treat as the first of a two song encore with F'n Up. I got as close as maybe 5 heads back, but saw some folks on the rail that were obviously more like me than the tame, albeit enthusiastic French crowd. Indeed they were enthusiasts, Thrashers Wheat t-shirt and all. Hey Neil , how bout getting relevant to the times of your beloved Americana , how bout no more guns MR Earth ! Peace and Love Eh ! ...... Ha ! You sing songs of the past , which are great relics to their time . What is happening to Americana ? ....... the land of guns and the free ...... No GMO's eh ... how relevant to the times ? re: Babbo B: Voila - thanks! “I want every song to be coming from me, not coming from who I was or who I’m trying to be or who people think I am or who they want me to be,” he said. “All those things are out. It’s just got to be: ‘Is this going to flow like water through me?". Scotz, thanks thats a great quote and have never seen it before. Misfits - that is a great call. John EH Connelly, I doubt if Neil sees any of the comments posted here but he almost surely has someone taking care of his social media so maybe you should post on his facebook page & leave us to our arguments about Jesus being God's second favorite kid. Bet you can't guess who's first? Neil Young has done his share of proselytizing over the course of his career, but never more so then he has recently. Last year’s Monsanto Years found him railing against corporate concerns and their poisoning of the year’s natural resources. Prior to that, his major concerns were focused on the nation’s political quagmire, a topic brought front and center on Living With War and, earlier, his signature song “Ohio” recorded with CSNY. The ravages of drug abuse became the subject of “The Needle and the Damage Done” and other tracks from that darker period in Young’s musical trajectory. Once both a wistful folkie and committed rocker, he’s now a prime example of an artist turned musical chameleon, one who inspires baited anticipation from fans with each new release. In the case of Earth, Young’s actually on a rare continuum, taking the ecological strains of The Monsanto Years and expanding the theme through live performances of older songs that fit that topic well. Consequently, several signature classic reappear here — a lovely “After the Goldrush” with added ethereal harmonies from Lukas and Micha Nelson, the CSNY outtake “Human Highway,” and “Vampire Blues,” given a particularly scalding treatment that adds context as well as content. Recorded live with his latest backing band of choice, Promise of the Real (who must make Crazy Horse feel as if they’ve been forcibly retired from their former day job), Earth has that ragged, raging feel that marked Time Fades Away, easily the bleakest entry in Young’s extended solo canon. Love that he is playing so many songs from his first and vastly underrated solo album on this tour. Old Laughing Lady is a masterpiece. Many of the major themes start here and continue to this day: dreams and love, loneliness and addiction, the city and the country, the moon and the stars. "It's all one song."